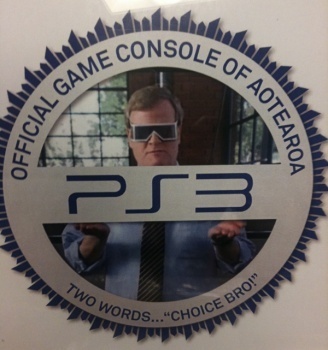 PS3 Becomes New Zealand's "Official Game Console"
New Zealand's TV3 is sorry for ripping off Kevin Butler's famous series of PlayStation 3 ads - so sorry, in fact, that it mailed him an apology package that included a plaque declaring the PS3 the country's "official game console." You may recall how New Zealand television station TV3 earned some surprise international attention a couple of weeks ago when it was discovered blatantly ripping off Sony's Kevin Butler ads for its lineup of Monday night programming. The campaign was pulled fairly quickly and to Sony's credit, it didn't raise a stink but instead handled it with a message from The Man himself, VP of International Diplomacy Kevin Butler, who offered to make Sony's entire library of commercials available for the station to copy and even threw in some helpful advice for "added epicness." There was only one catch: Butler wanted TV3 to help make the PlayStation 3 the "Official Game Console of New Zealand" - plus the box set of Flight of the Conchords for the guys in marketing. Believe it or not, TV3 has actually come through: A package from the station arrived at Sony's offices earlier today containing several items, including Pascall Pineapple Lumps, a jar of Marmite, Milo Chocolate Drink Mix, a bag of Toffee Pops, a super-sweet plaque declaring the PlayStation 3 the "Official Game Console of Aotearoa" (which, according to Wiki, is "the most widely known and accept Maori name for New Zealand") and even the first two seasons of Flight of the Conchords. Butler posted pictures of the loot on Twitter, where he also referred to the "fine, fine folks at TV3," suggesting that all has been forgiven. This is just about a perfect resolution to a situation that could have turned very ugly; there's no question the station was in the wrong, but Sony's reaction - and TV3's follow-up - is proof that sometimes a light touch is the best approach. Choice, bro!